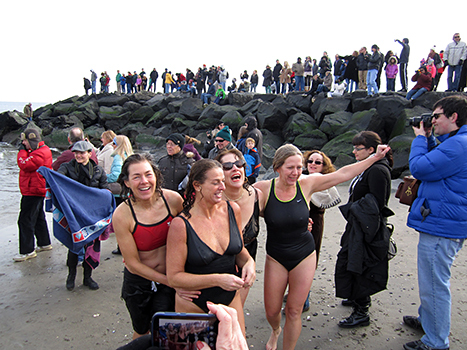 It's Polar Bear Plunge time again. Yes folks, I'm throwing myself into the icy Atlantic off the Asbury Park Boardwalk, somewhere around 11:30-12:00. We dive by Convention Hall, so if you want to be part of the craziness, come on down. Darn, this was really cold! I'm in the sunglasses. Too funny. Praising God with voice and guitar. On the altar at St. Mary's Church, Deal. Mass at 10:00. Come on in and charge your batteries for the new year. My husband Charlie has started a nice guitar duo gig every Friday at Biaggio's Italian Restaurant, 12 Broad St., Red Bank. 6:30-9:30, BYOB, great wood fired pizza oven. The Mill, in Spring Lake Heights. 8-11, Steve Elmer, piano; Mike Carino, bass and Desi Norman on vibes. Call for reservations in the lounge, this room can fill quickly, 732-449-1800. Never a cover, great food, and a good pour! Singing for God. You know where. Three voices and two guitars. Very nice. Feb.8 (Sat. ),14 & 28 - Charlie's duo is at Biaggio's. Nice little spot. 6:30-9:30, BYOB. With my guitar players singing praises at the 10:00 AM mass. You have the gist. The Tides Hotel in Asbury Park, 7th Ave. 6:00-9:00 in their very cool lounge area, with Gladstone Trott on piano and Desi Norman, vibes. Full menu. The cutest boutique hotel, lounge and dining room. And a good pour! Presentation of my union Gold Card, by Vice President Rich Hensley of Local 399 of the American Federation of Musicians. So proud. Bruce Springstein got one too! The 55 Bar in NYC, Gladstone Trott, piano, and Bryan Carrott on vibes. We'll be celebrating St. Pat's Day, wear some green. Snacks and gifts for all. Confirmed for the early show. My angelic Children's Choir will be singing at the 10:00 mass at St. Mary's. These kids are darn good. Stop on down and enjoy the joyful noise. A repeat gig for the Long Branch Chamber of Commerce. Rio Clemente, Mike Carino, Desi Norman. This is a typical club date, but just letting you know we do private parties too! Dinner dance for the Visiting Nurses of America (a regular gig) with Rio Clemente's band at the Madison Hotel. Just a reminder that we do private parties as well as concert performances. May 12 - Doing a live, on-air interview with John Bonhannon of WRHU, 88.7 FM around 3:00. Check it out, live from the Jazz Cafe'. Doing a live, on-air interview with John Bonhannon of WRHU, 88.7 FM around 3:00. Check it out, live from the Jazz Cafe. Trumpets in Montclair, with Rio Clemente, Desi Norman and Mike Carino. This is my birthday celebration and we will have a large cake for everyone in the house to share. Come out and celebrate this happy event with me. What a present that will be. 8:00-11:30 ish. With Rio Clemente at the Daughters of Israel in West Orange. 2:30-4:00. It's wonderful to see these oldsters enjoying the music. My Angelic Children's Choir will be finishing up their season of joyful noize with a Father's Day Concert at St. Mary's Church, Deal. 10:00 AM mass. Come down and charge up your batteries. My fabulous 14 piece big band at the Raritan Waterfront Park, South Amboy. Always a great venue. Bring chairs and libations. Rain location in the high school just prior to the park. 6:30-8:30. At the Randolph Library with Rio Clemente and his band. 7:00 PM. With the Broadway Pops Big Band at Spring Lake Park Gazebo. Under the skillful leadership of Gregg Gianniscolli.6:30-8:00. No rain location. Again with the Broadway Pops Big Band, this time at Thompson Park Gazebo, Jamesburg. 2:00-3:30. The Broadway Pops Big Band at the Warren Park Mini-Theater, Woodbridge. 6:00-7:30, no rain location. With my big band again at Warren Park, Woodbridge, 6:00-7:30. No rain location. Chairs and libations always a treat. 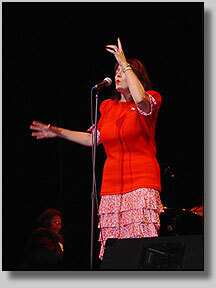 Sandy, swinging with her big band on one of her many outdoor concerts this year. My swinging big band at the Spring Lake Park Gazebo, South Plainfield. 6:30-8:00. No rain location. With my pal, Rio Clemente doing a lovely little house party. Just reminding you we do private parties too! 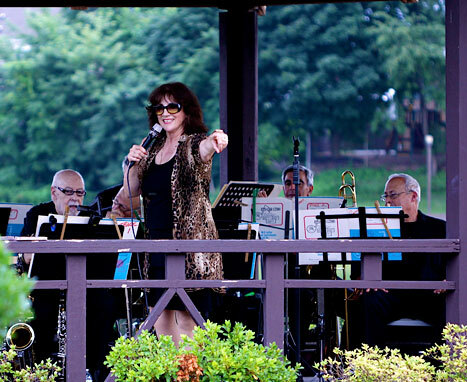 The Sandy Sasso Big Band at the Thompson Park Gazebo, Jamesburg. 2:00-3:30. No rain location. The Mill, Spring Lake Heights, still 8:00-11:00, still no cover, still great food and drinks. Come on down at enjoy the beautiful beginning of the fall season watching the swans. With my trio, of course. The Hotel Tides, 7th Ave., Asbury Park, 7:00-10:00 with the trio. Very cool room with a cool vibe. Delicious food, good drinks. Come and hang with us in the lounge. Halloween Night at The 55, NYC! You know this will be a fun night. 6:00 show, and if you're in the mood, wear a funny hat to help celebrate. Halloween in the Village. Oh my...........snacks and little gifts as always. Brad Mandigo, piano. Mike Carino, bass and Bryan Carrott on vibes. The Mill in Spring Lake Heights with my wonderful trio, feautring Rio Clemente, piano, Mike Carino, bass and Bryan Carrott, vibes. 8:00-11:00. Beautiful room with great food and a good pour. Reservations in the lounge a good idea. 732-449-1800. Celebrate the Holidays with our annual holiday party at The 55, NYC. The early show, with the usual little treats for the audience. With my usual trio. My angelic Children's Choir of St. Mary's of the Assumption Church in Deal will be singing the 10:00 mass. Come out and enjoy a spiritual gift to yourselves. Cocktails by Two (my husband Charlie's fab trio) will be at Nino's Bar and Restaurant, Rt. 35, Oakhurst from 6-9. No cover, great pizza. 732-359-8880. Check out their video! Cocktails by Two, back at Nino's from 6-9 PM. Stop in and enjoy some really nice music. New Year's Eve celebration at the Hotel Tides, 7th Ave., Asbury Park. 9:00-12:00 with my wonderful trio. Call for dinner reservations 732-897-7744 or visit Hotel Tides New Years Eve 2014 for more information. More to come, so check in once in a while. Thanks!